Comfort House Metal Address Plaque Personalized With Arch Top. Display your house number and street name. Custom house number sign 67813F2 wall mount. by Comfort House at Community Greenhouse. MPN: 67813F2. Hurry! Limited time offer. Offer valid only while supplies last. 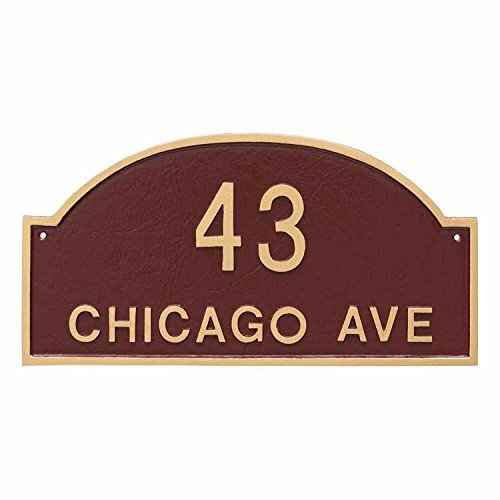 Rust free aluminum metal address plaque personalized with up to five 3" numbers on line 1 and up to 17 characters on line 2. Arch shape wall mounted house sign. Mounting hardware included. Choose from 26 colors including antique copper, black, hunter green, sky blue, gray, white, navy, sand, and taupe. Gold or silver numbers. Border is same color as numbers. Size: 15.75"W x 8"H. Font as shown in illustration. All letters on this sign are capital with the first letter of each word a small bit larger. Made in USA. Comfort House # 67813F2. Other sizes, shapes, materials, and finishes available. Gzhihine Wall Scroll Cartoon Fantasy Fisherman House Fairytale Underwater Life Fishes Coral Cloudy Sky Wall Hanging Blue Brown Green 30"x20"
Gzhihine Wall Scroll Farm House Decor Autumn View A Forest With Faded Color Leaves European Northern Dutch Fall mage Decor Orange Green 30"x20"
Gzhihine Wall Scroll Cartoon Fantasy Fisherman House Fairytale Underwater Life Fishes Coral Cloudy Sky Wall Hanging Blue Brown Green 24"x16"
Gzhihine Wall Scroll Fantasy House Decor Collection View Of Fantasy River with A Pond Fish And Mushroom Jungle Trees moss eden Wall Hanging Green Teal Red 28"x14"
Gzhihine Wall Scroll Farm House Decor Collection Old Wooden Barn with Rusted Tractor on Hillside Enclosed with Wooden Fence and Trees Wall Hanging Green White 30"x20"
Gzhihine Wall Scroll Farm House Decor Collection Old Wooden Barn with Rusted Tractor on Hillside Enclosed with Wooden Fence and Trees Wall Hanging Green White 24"x16"